Silver nanoparticles (AgNPs) are frequently utilized nanomaterials due to their anti-microbial properties, optical properties and high electrical conductivity. The sonochemical route using kappa carrageenan is a simple, convenient and environmental-friendly synthesis method for the preparation of silver nano particles. κ-carrageenan is used as a natural eco-friendly stabilizer, whilst power ultrasound acts as a green reducing agent. Elsupikhe et al. (2015) have developed a green ultrasonically-assisted synthesis route for the preparation of silver nanoparticles (AgNPs). Sonochemistry is well known to promote many wet-chemical reactions. Sonication enables to synthsize AgNPs with κ-carrageenan as natural stabilizer. The reaction runs at room temperature and produces silver nanoparticles with fcc crystal structure without any impurities. The particle size distribution of the AgNPs can be influenced by the concentration of κ-carrageenan. The Ag-NPs were synthesized by reducing AgNO3 using ultrasonication in the presence of κ-carrageenan. To obtain different samples, five suspensions were prepared, by adding 10 mL of 0.1 M AgNO3 to 40-mL κ-carrageenan. The κ-carrageenan solutions used were 0.1, 0.15, 0.20, 0.25, and 0.3 wt%, respectively. The solutions were stirred for 1h to obtain AgNO3/κ-carrageenan. Then, the samples were exposed to intense ultrasonic irradiation: The amplitude of the ultrasonic device UP400S (400W, 24kHz) was set to 50%. Sonication was applied for 90min at room temperature. The sonotrode of the ultrasonic liquid processors UP400S was immersed directly into the reaction solution. After sonication, the suspensions were centrifuged for 15min and washed with double distilled water four times to remove the silver ion residue. The precipitated nanoparticles were dried at 40°C under vacuum overnight to obtain the Ag-NPs. To evaluate the results, the samples were analyzed by UV-visible spectroscopic analysis, X-ray diffraction, FT-IR chemical analysis, TEM and SEM images. The number of Ag-NPs increased with increasing κ-carrageenan concentrations. The formation of Ag/κ-carrageenan was determined by UV-visible spectroscopy where the surface plasmon absorption maximum was observed at 402 to 420nm. The X-ray diffraction (XRD) analysis showed that the Ag-NPs are of a face-centered cubic structure. The Fourier transform infrared (FT-IR) spectrum indicated the presence of Ag-NPs in κ-carrageenan. Transmission electron microscopy (TEM) image for the highest concentration of κ-carrageenan showed the distribution of Ag-NPs with an average particle size near to 4.21nm. Scan electron microscopy (SEM) images illustrated the spherical shape of the Ag-NPs. 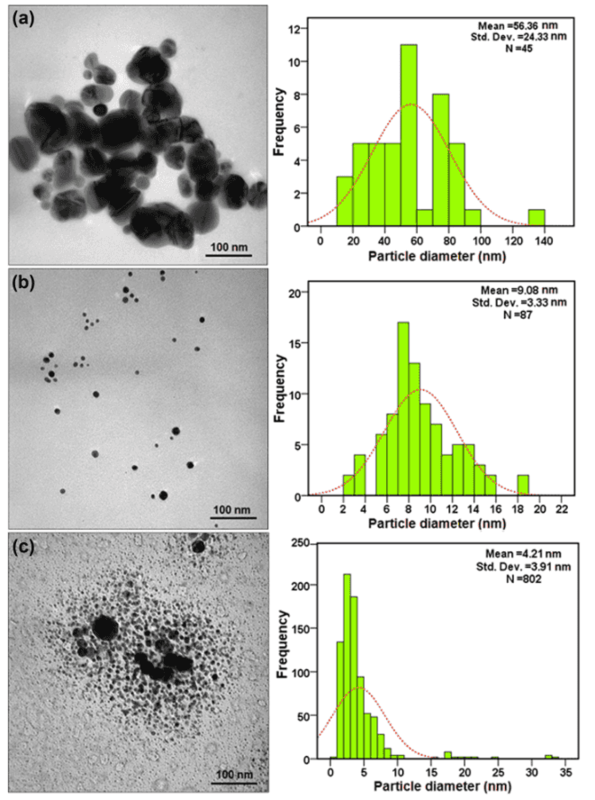 The SEM analysis shows that with increasing κ-carrageenan concentration, changes in the surface of Ag/κ-carrageenan occurred, so that small-sized Ag-NPs with spherical shape were obtained. TEM images and corresponding size distributions for sonochemically synthesized Ag/κ-carrageenan at different concentrations of κ-carrageenan. [0.1%, 0.2%, and 0.3%, respectively (a, b, c)]. 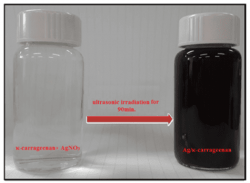 Elsupikhe, Randa Fawzi; Shameli, Kamyar; Ahmad, Mansor B; Ibrahim, Nor Azowa; Zainudin, Norhazlin (2015): Green sonochemical synthesis of silver nanoparticles at varying concentrations of κ-carrageenan. Nanoscale Research Letters 10. 2015. 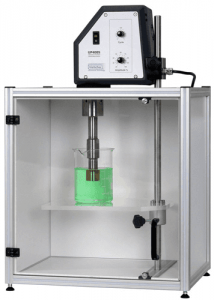 When powerful ultrasound is applied to chemical reactions in solution (liquid or slurry state), it provides specific activation energy due to a physical phenomenon, known as acoustic cavitation. Cavitation creates high shear forces and extreme conditions such as very high temperatures and cooling rates, pressures and liquid jets. These intense forces can initiate reactions and destroy attractive forces of molecules in the liquid phase. Numerous reactions are known to benefit from ultrasonic irradiation, e.g. sonolysis, sol-gel route, sonochemical synthesis of palladium, latex, hydroxyapatite and many other substances. Read more about sonochemistry here! Silver nano-particles are characterized by a size of between 1nm and 100nm. While frequently described as being ‘silver’ some are composed of a large percentage of silver oxide due to their large ratio of surface-to-bulk silver atoms. Silver nanoparticles can appear with different structures. Most commonly, spherical silver nanoparticles are synthesized, but diamond, octagonal and thin sheets are also utilized. Silver nanoparticles are highly frequented in medical applications. The silver ions are bioactive and have strong antimicrobial and germicidal effects. Their extremely large surface area allows for the coordination of numerous ligands. Other important characteristics are conductivity and unique optical properties. For their conductive features, silver nanoparticles often incorporated in composites, plastics, epoxies and adhesives. The silver particles increase the electrical conductivity; therefore silver pastes and inks are frequently used in the manufacturing of electronics. Since silver nanoparticles support surface plasmons, AgNPs have outstanding optical properties. Plasmonic silver nanoparticles are used for sensors, detectors and analytical equipment such as Surface Enhanced Raman Spectroscopy (SERS) and Surface Plasmon Field-enhanced Fluorescence Spectroscopy (SPFS). Carrageenan is a cheap natural polymer, which is found in various species of red seaweeds. Carrageenans are linear sulphated polysaccharides that are widely used in the food industry, for their gelling, thickening, and stabilizing properties. Their main application is in dairy and meat products, due to their strong binding to food proteins. There are three main varieties of carrageenan, which differ in their degree of sulphation. Kappa-carrageenan has one sulphate group per disaccharide. Iota-carrageenan (ι-carrageenen) has two sulphates per disaccharide. Lambda carrageenan (λ-carrageenen) has three sulphates per disaccharide. Kappa carrageenan (κ-carrageenan) has a linear structure of sulfated polysaccharide of D-galactose and 3,6-anhydro-D-galactose. κ- carrageenan is widely used in the food industry, e.g. as gelling agent and for texture modification. It can be found as additive in ice cream, cream, cottage cheese, milkshakes, salad dressings, sweetened condensed milks, soy milk & other plant milks, and sauces to increase the product viscosity. Furthermore, κ-carrageenan can be found in non-food products such as thickener in shampoo and cosmetic creams, in toothpaste (as stabilizer to prevent constituents separating), fire fighting foam (as thickener to cause foam to become sticky), air freshener gels, shoe polish (to increase viscosity), in the biotechnology to immobilize cells/enzymes, in pharmaceuticals (as an inactive excipient in pills/tablets), in pet food etc.